As is known, people in the past had several holidays which at some point have been abolished, yet are still kept alive in the folk culture [...]. One of the most famous of these is Joannesfesten on the 24th of June, popularly called "Jonsvaka", or "Jonsok". For many a year, this day has been widely known as a folk festival, and is celebrated even to this day. It is however, not the actual day, but the previous evening, Jonsok-aften, Midsummer-Eve, which is devoted to cheerful play and merriment. 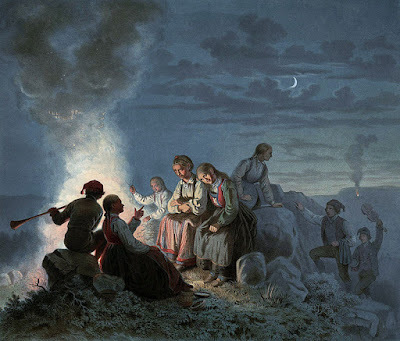 While Midsummer originally was a feast commemorating John the Baptist's birth, there may be several other reasons why jonsok/sankthans (Norway and Denmark), juhannus (Finland), or midsommarafton (Sweden) still remain as such an important part of the Nordic culture. The most prominent one however, is inextricably associated with the solstice, as this feast represents the same turning point for summer, as Christmas does for winter. In the northernmost parts of the Nordic lands, the sun does not even set this time of year, and further down south its absence is so modest, that the darkness of night is basically absent. The occurring of Midsummer Eve at the end of June is therefore a great celebration of the brightness of the Nordic summer, as well as a warm welcome of the season of fertility. In Sweden, Midsummer Eve, or midsommarafton, is considered the most typical Swedish tradition of all, and always takes place on a Friday between the 19th and the 25th of June. 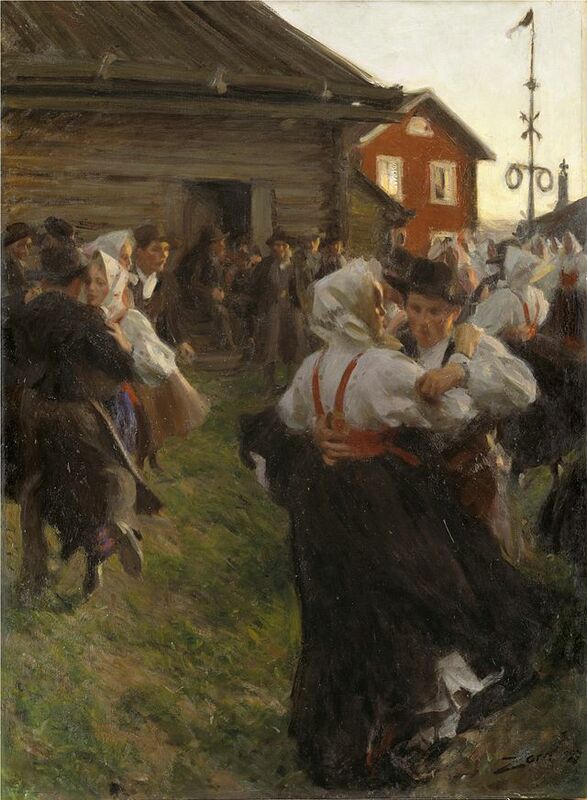 The Swedish artist Anders Zorns' painting Midsommardans (Midsummer Eve Dance) from 1897, displays a traditional Swedish feast, taking place at a beautiful bright summer night. The key component in the celebrations is the maypole, which is basically a tall wooden pole, symbolizing the tree, beautifully decorated with flowers and wreaths. It is raised in an open spot before traditional ring-dances ensue, to the delight of the children and some of the adults. Long lunches consisting of herring with potatoes, chives and sour cream and hard liquor, women and children with flowers in their hair, dancing and singing is a big part of the celebration. Decorating with leaves and wild flowers is overall a beloved custom throughout Scandinavia, and stems from the desire to protect and bless the home. Trees and flowers were namely believed to be extra powerful around midsummer, and many went out collecting medicinal plants and herbs. In earlier times, it was told that if a young girl picked seven or nine different herbs that night, and put it under her pillow, she would dream of her future husband. The tradition of braiding flowers to wear as headbands is also still strong in the Scandinavian lands. This custom reportedly originate from the story of a farm woman, who around the solstice picked corn straw and wildflowers which she braided, while she sang a song that would awaken the field. Before the advent of Christianity, the Midsummer festival in Finland was held in honor of Ukko, the Finnish god of the sky, weather, harvest and thunder. It was then called Ukon juhla (Festival of Ukko). Since 1955, the holiday has always been on a Saturday (between June 20 and June 26), and is today known as Juhannus, after John the Baptist. In Karelian tradition, many bonfires were burned side by side, the biggest of which was called Ukko-kokko (the "Old Man Bonfire"). This tradition remain today as a key element in the Finnish tradition, and that Saturday at the end of June, thousands of bonfires are burned at lakesides and by the sea. Swedish-speaking Finns also often celebrate by erecting a maypole, in the spirit of midsommarafton. In Norway and Denmark, the day is celebrated on June 23rd, and is still called Jonsok (Johannes-vake) or Sankthans, after John the Baptist Danish saint's name, St. Hans. 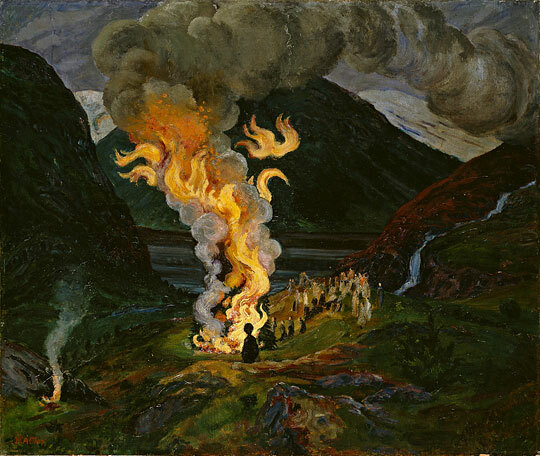 The focal point in these lands, as well as in Finland, is a "brising"; flaring bonfires on headlands and hills. 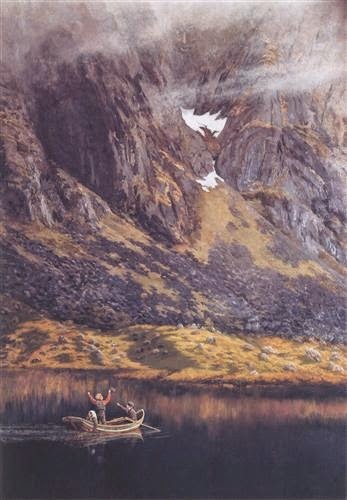 The use of bonfire is insoluble related to the old Norse celebration of the suns incipient shift from summer to fall; with fire, one would help the life-giving powers to strengthen the sun at a critical turning point in nature. Many places it was also customary to place a witch doll on the pyres, as it was important to protect against witches and black magic that day. For it was not only people who celebrated Midsummer night; it was believed in fact to be one of the witches' main festivals. According to the traditional folk belief, fire had the power to cleanse and eradicate evil forces, and the act imitated the burning of witches in previous times. After Norway was liberated from Hitler-Germany in the spring of 1945, ragdolls symbolizing famous Nazis were also burnt at the stake. 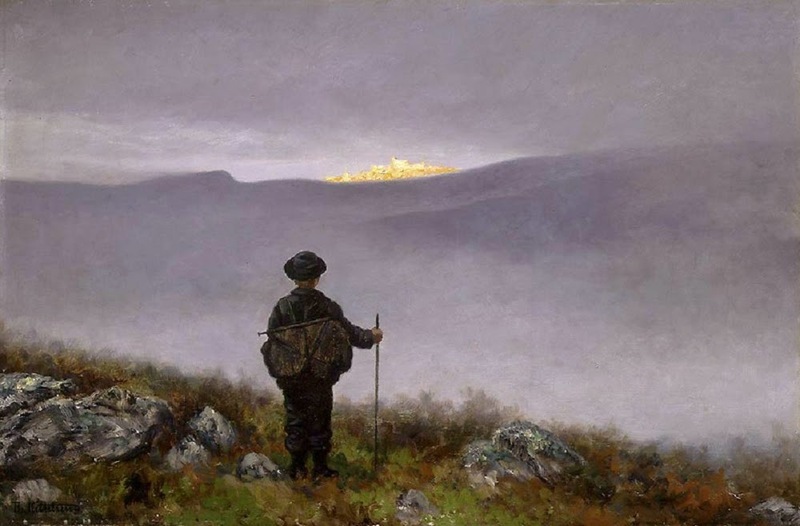 Midsummer Night, when the bonfires flared all over the mountains, and people swarmed like little black dots over the mountain side, then it was a sin for a Christian to join. My sister and I stood at a distance behind the fence, seeing and hearing how the others danced around the bonfire, joyfully shouting and laughing throughout the night. The dislike of using bonfires as a way to celebrate had overall grown stronger during the rise of pietism in the 1700s, and was officially considered a superstitious, pagan relic. In Sweden, the custom was banished in 1762, which can help to explain why the use of the maypole increasingly became the key component in the celebrations. In Norway and Denmark, the prohibition was conducted a few years later, in 1770. Here, however, the old traditions actually grew stronger, rather than to subside. It is believed that the prohibition in fact strengthened the status of the feast, as it gave people the freedom to celebrate as they saw fit. The evening could therefore evolve into a great deal of hustle and bustle. According to Ivar Aasen, a Norwegian poet and philologist, people fired rifle shots, blew their horns and shouted and screamed for to somehow notify the neighbors that the “show” had finally begun. Usually, farms and hamlets had communal bonfires, and to bring forth the biggest, brightest and most long-lasting bonfire became a matter of honor. Many amused themselves by jumping over the fire, running through the smoke, playing and dancing till the bonfire finally died out. Then only embers were left to tell the tale – as testimonies of the brightest night of the year, and as tokens of the shorter, darker days to come. Wikipedia: The Free Encyclopedia. “Midsummer, Finland”. https://en.wikipedia.org/wiki/Midsummer#Finlandhttps://en.wikipedia.org/wiki/Midsummer#Finland. Retrieved 12/06.15. Ørnulf Hodne. Norsk Folketro. Cappelen: 1999.